Is It War or Is it Art? Could be a play, right? An opera. Street theatre. A scene from an avant-garde movie. In any case, the hints of commedia dell’arte are there to be seen. And why else would a bloodied woman be smiling, if she’s not play acting? You tell me. 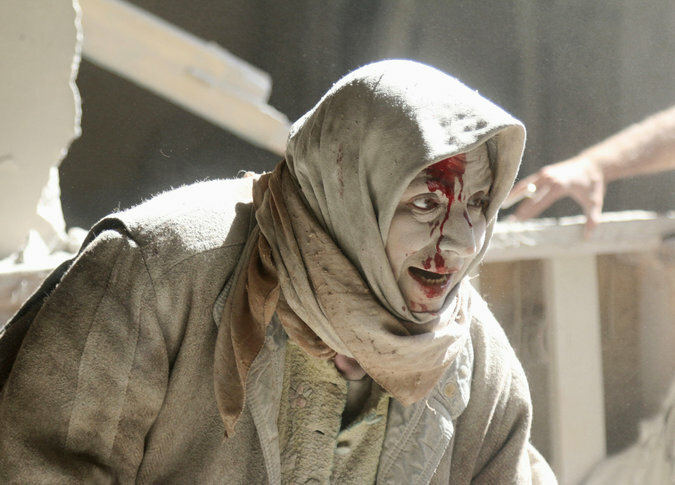 In fact, she is a woman injured in an airstrike in Aleppo. But is that news? Lots of women have been injured by airstrikes in Aleppo, and there appears to be nothing politically or militarily distinctive about this strike and this woman. Except perhaps that she got off much better than many, but that doesn’t seem to be the emphasis, either. It may explain the apparent smile, but that could be an illusion as well: she could simply have been caught in a tiny sliver of time on the way to another, more serious expression. So why show the photograph at all? The answer to that question seems obvious: the image is aesthetically distinctive. The resonances with other arts are precisely to that point: there is a strongly artistic quality to the photograph, which is at once painterly, cinematic, and theatrical. The photo seems especially theatrical to me, but that may be beside the point. What is important is that we see it as a work of art. Only then can we consider what might be the artistic statement–or perhaps the artistic enigma–that is being presented to the spectator. She is both a woman and a character, an individual person and a distinctive image, another data point in the statistics of violence and a compelling assertion of the vitality, beauty, wonder, and sheer good luck that is a human life. Not everyone is so lucky. At the end of the day, difference between art and war is not between aesthetics and something else: it is between a celebration of life and another, all too human propensity to kill indiscriminately. Sometimes a photograph can remind us of what is at stake by showing us both at once, and how the difference between them can lie in a tiny sliver of time. The time, for example, between surviving the attack or not; the time between life and death; the time of photography.